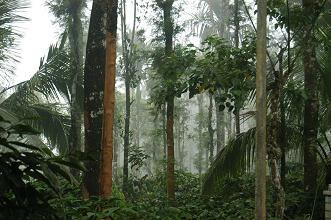 Wayanad tourism is off the radar for many foreign tourists. The district covers an area of 2,131 square kms with the altitude being 700-2100m above sea level. This gives a slightly cooler climate than coastal and low-inland Kerala. Prominent features of the landscape include coffee and tea plantations, rolling hills, dense forests of tall and slender palms, fruit trees, huge blue skies, streams and plunging waterfalls. Despite its scenic beauty, Wayanad tourism is low-key, with Indian honeymooners making up most of the numbers. 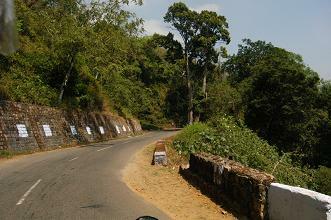 The main town near to the Vythiri hill station is Kalpetta - a good starting point for exploration in the area. Other towns in Wayanad such as Sulthan Bathery and Mananthavady are situated in close proximity to the Wayanad wildlife reserve, and can be good bases from which to explore the park. Chembra Peak 17 kms west of Kalpetta town, the 2100m high Chembra Peak towers above its surroundings. Independent trekking for confident climbers with a permit is possible. Visit the DTPC in Kalpetta for guides (R.600 per day), camping equipment and permit information (plus maps and further Wayanad tourism info.) There is a lake at the top and stunning views. Lakkidi and Pookot Lake Lakkidi is the entrance to Wayanad from the south, an ascent that takes the traveller up nine hair-pin bends with jaw dropping views. Nearby Pookot Lake is a small almost 'twee' natural lake with boating facilities and a pleasant walk around the bank. Excellent home-made chocolate (definitely a feature of the mountain areas in Kerala and Tamil Nadu) is on sale in the small cafe here. Banasura Sagar Dam A huge, beautiful dam surrounded by tall peaks. Boating facilities are available but the speedboat perhaps shouldn't be encouraged too much! 25 kms north west of Kalpetta it is a bit far if you do not have your own trasport, though rickshaw drivers will take you and wait while you look around. Enquire at the Kalpetta DTPC for buses (info. below). Edakkal Caves Situated on Ambukutty Mala, 25 km from Kalpetta this cave houses some ancient stone-age carvings. Very steep climb from the capark with great views. 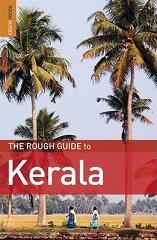 Hyped by Wayanad tourism guides, the guietest time to visit is in the morning. Note about attractions: The popular Wayanad tourism attractions are fairly 'spaced apart' but the scenery between them is an attraction in itself. If you do not have your own transport consider paying a rickshaw driver for the day to see a few places. Agree on the price before hand. 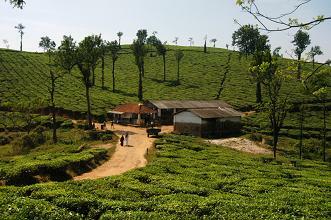 Alternatively, talk to your hotelier or any Wayanad tourism office about excursions. The third option is to find a base and explore on foot. The countryside is beautiful and there is plenty to see. The main transport hub for south Wayanad with easy access to other Keralan towns and cities, Kalpetta is a good starting point for visitors to the region. There are a few budget accommodation options in town, but it is the homestay scene that is especially popular in Wayanad tourism. Kalpetta's main road, the NH 212 is fairly busy and surrounded by small shops, cafes, a couple of ATMs, a DTPC tourist office (tel: 04936-204441/202134, www.dtpcwayanad.com) and a KSRTC bus stand. There is no railway station at Kalpetta, and the easiest option is to get here by public bus from coastal Calicut/Kozhikode (75 kms). The journey is inexpensive but involves steep ascents (though in a bus, at least your driver has 'right of way'). Private coach or taxi are another option, and you just might be able to convince a rickshaw driver to take you here, if you are both crazy enough. We followed the road on a Royal Enfield motorcycle. If you are taking your own transport have a look at our road map of India page for some useul tips about traffic and navigation. Buses connect to Wayanad's other major towns of Mananthavadi and Sulthan Bathery (for the wildlife reserve). Have a browse at the KSRTC bus stand in Kalpetta (tel: 04936-203040) - ask any shop owner/rickshaw driver for directions - you will probably find buses going to many Keralan or Tamil destinations. Wayanad tourism (mainly accommodation) can be a little pricey. We met a group of three travellers struggling to find budget options in Kalpetta town. Eventually they found (and were very satisfied with) the PPS Tourist Home (www.ppstouristhome.com) which is just off the main road. Doubles here are R.500 a night. At the end the Ghat Road that climbs the steep mountain side to Lakkidi there is a Ficus Tree bound with a heavy chain. Legend has it that this chain holds the spirit of Karinthandan, a local man who helped guide a British Engineer up the mountain to Lakkidi. The Engineer, not wanting his guide to share the secret with anybody else murdered Karinthandan, whose angry spirit is said to have caused many accidents on the road until it was tied to the Ficus Tree by a priest. Due to a trend in Wayanad tourism the homestay scene is becoming the most popular accommodation option around Kalpetta and Vythiri. Homestays are often beautifully decorated, friendly and a little expensive (though nothing compared to what you would pay at home). We spent more in Wayanad on acommodation than we usully do when in India, but did not regret it at all. We stayed at the beautiful Rainbow Holiday Home on Old Market Road (tel: 673122) which was up a quiet lane just outside Kalpetta. The place is surrounded by palm and fruit trees. Our hosts were continually gracious and knowledgeable about the area. The rooms were wonderful - more like small appatments - and I would recommend it to anyone without hesitation. Another option that was spoken highly of by friends we met on the trip were the Stream Valley Cottages in Vythiri which are (unsuprisingly) private cottages on the bank of a stream (tel: 255860, www.streamvalleycottages.com). If you are in Kalpetta, ask around until you find Udupi's Family Restaurant. It is off the main road at the end of a small parade of shops - unfortunately I don't remember the street name. Here they serve delicious Keralan food on banana-leaf plates. Several small dishes are served, thali stlye, and you can top up the ones you like. Forget about knives and forks and dig in with your (right) hand. If you fancy a beer with your meal (sometimes hard to get in Kerala) it is worth trying at the PPS Tourist Home on Pinagode Road (off the main street) where they also serve good Chinese dishes, Indian food and some continental fare. Even in the hot season it is worth bringing a fleece and long trousers for colder nights. If you enjoyed this Wayanad tourism page, and like to travel 'off the beaten track' have a look at the pages on Kappad Beach and Thalassery for some inspiration on Kerala's coast. Discover more south India's beautiful hill stations! Relax on the beach, sip cocktails at sunset, explore Varkala's amazing cliff top restaurants. Can you recommend any great Varkala hotels? Established since the 70's, Kovalam is one of Kerala's best known beach resorts. Kerala has so much to offer for any traveller but with the freedom of the open road, it really does come into it's own.